Now with LASER CUT BALSA PARTS!!! Tempered in the Spanish Civil War, the Messerschmitt BF-109 was ready and waiting when the German invasion of Poland started World War 2. The outstanding fighter of the day, the Messerschmitt quickly overcame all opposition and maintained its supremacy in the skies until it met its equal in the famed British Spitfire. During the war, the Messerschmitt fought on every front in which the German Luftwaffe was engaged. 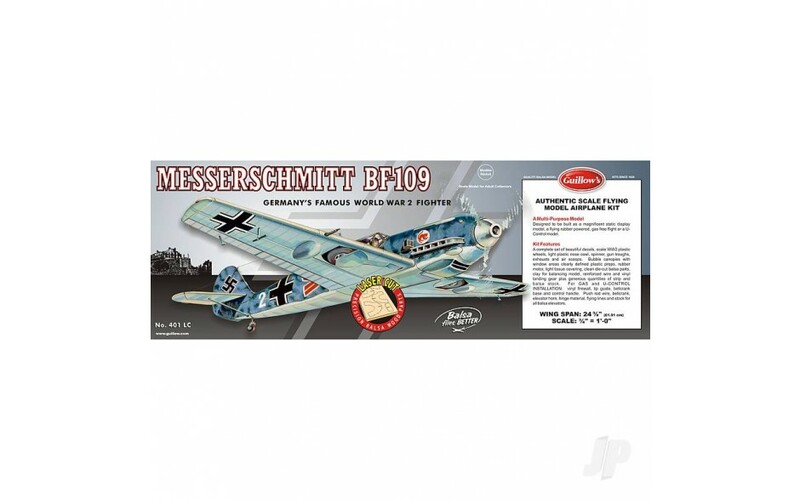 Quality scale balsa model airplane kits. These model construction kits have scale realism for the super detail fan and light weight for those who build and fly. Each model is a small but faithful replica of an airplane widely known for deeds in wartime or present day popularity. Additional items are required to complete this kit:- Adhesive, modelling tools, Dope, paint, brushes etc.